Marani Brands, Inc. (OTC BB:MRIB.OB - News) is pleased to announce that it has been selected as a sponsor of the "The Detournements of Wynn Miller" on Saturday, June 13, 2009 from 7 to 11pm. The exciting event will be held at the Exhibit A Gallery located at 1086 South Fairfax Ave, in Los Angeles, California. The Exhibit A Gallery (www.exhibitagallery.com) is known throughout the art world as a hotspot for trend setting and cutting-edge exhibitions.The exciting event is a tribute to two artistic legends: Tony Alva, skateboarding godfather and original bad boy of Venice Beach's infamous "Dogtown," and Wynn Miller, the influential photographer who captured the legendary Alva on and off-board during the height of the skateboarding revolution of the 1970s. A collection of these iconic photographs, appropriately named "The Mad Dog Chronicles," is now touring the nation. 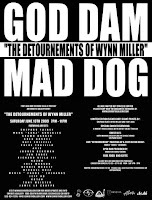 "The Detournements of Wynn Miller" will feature some of the art world's greatest contemporary talents including: Shepard Fairey, Eric Monson, Mark Gonzales, Nate Frizzell, Chloe Trujillo, Robert Trujillo, Axis, Jon Chase, Dennis McNett, Lauren Bergman, Richard Villa III, Nazrn, Shawn Barber, Votan, Michael Ruiz, and Jeff Ho. Each artist will be painting their version of a Wynn Miller photograph.